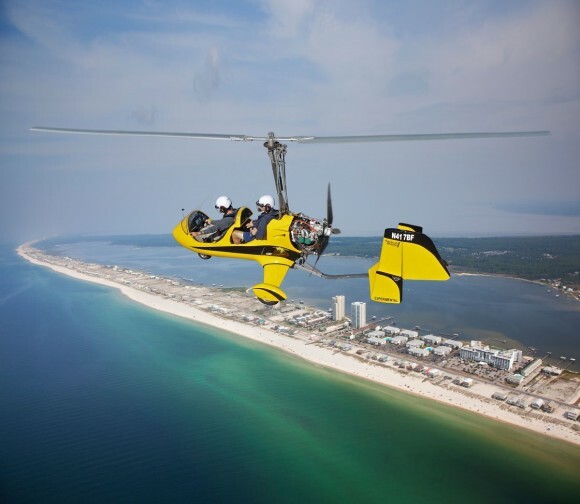 Discover the thrill of flight over the beautiful Emerald Coast beaches in a gyroplane. Unlike a typical tour flight, you get an opportunity to fly the aircraft with the help of an FAA-Certified flight instructor. Gyroplanes provide a uniquely stable flying experience as they are not affected by wind and turbulence like conventional airplanes. You will be fitted with a flight headset for clear communication and protective helmet with windscreen. Gracefully climbing skyward, you will fly a short 2-mile hop to the beautiful beaches along Gulf Shores. You will be immersed in an expansive landscape as you depart the airport. Approaching the coastline you will get the opportunity to fly the aircraft under the expert guidance of your flight instructor. You will get to ditch the crowds and get a one-on-one experience. Choose from the 20-minute, 40-minute or 60-minute flights and view rays, dolphins and other wildlife along the coastline. Come fly high with us today and experience the beaches from a different angle.